The kitchen design is for an apartment or a limited space house using a basic island kitchen theme. Wooden flooring marks the focus of the relatively open kitchen with a table top and chair nearby to grab a bite while catching up with the latest news. The neat and tidy electric chimney using good quality metal implements sophistication in the kitchen. A stainless steel sink blends with the chrome plated faucet that creates a good blend with the simple kitchen. Greenery in the form of floral arrangements – basic creates a feeling of warmth. Wooden cabinets below the sink and prep area, makes it ideal as storage. 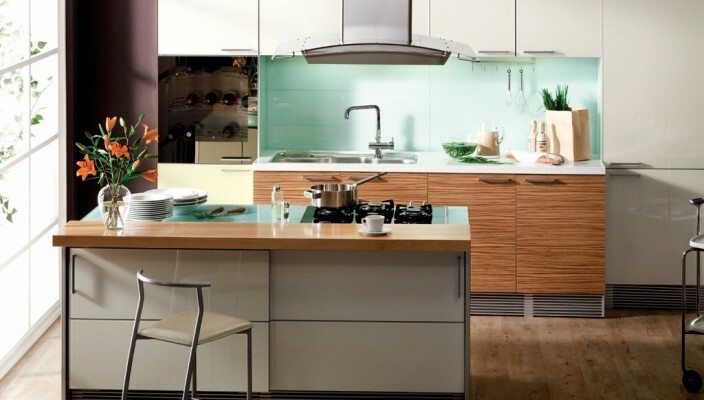 Modular cabinets with a laminated coating, blends well with the simplistic look of the small open island kitchen design. Additional storage space is provided with sliding panels to keep away the kitchen utensils. The open look of the windows ensures that light flows in twenty four seven. Lighting is required only at night.